CHILDREN. We encourage them to be like us and share our interests. We expect them to grow into the shoes of their parents and reach for the heights we failed to attain. Sometimes they become images of ourselves. Sometimes they don’t. Perhaps that’s not such a bad thing . . .
We’re motoring through France, bouncing round in a 1300cc Vauxhall Astra that smells faintly of petrol. 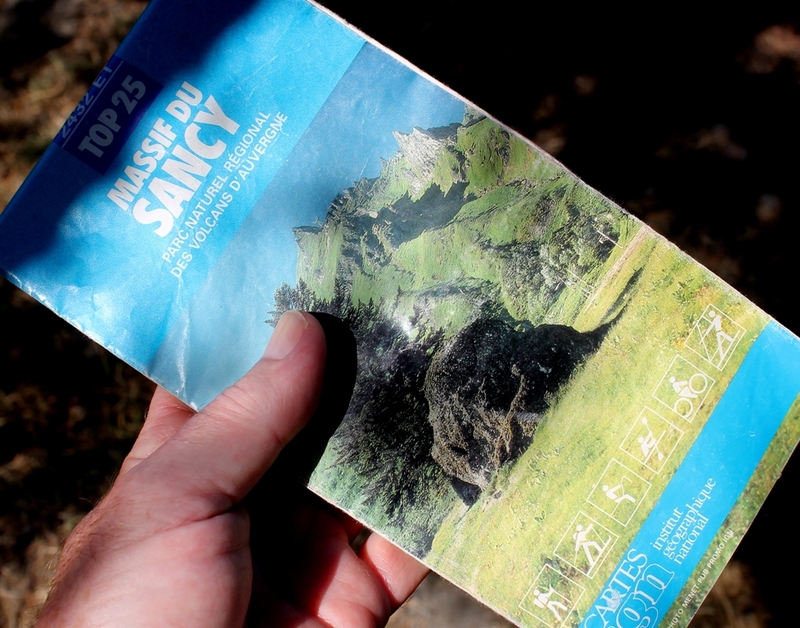 We find a suitable campsite on the outskirts of Issoire, south of Clermont-Ferrand, and spend a few hours exploring its mediaeval streets, searching for a shop that sells walkers’ maps. To the west of the town, strange mountains rise tall and abrupt above a wooded plateau. Next morning we park at their foot in warming sunshine and a wind that smells of hay. 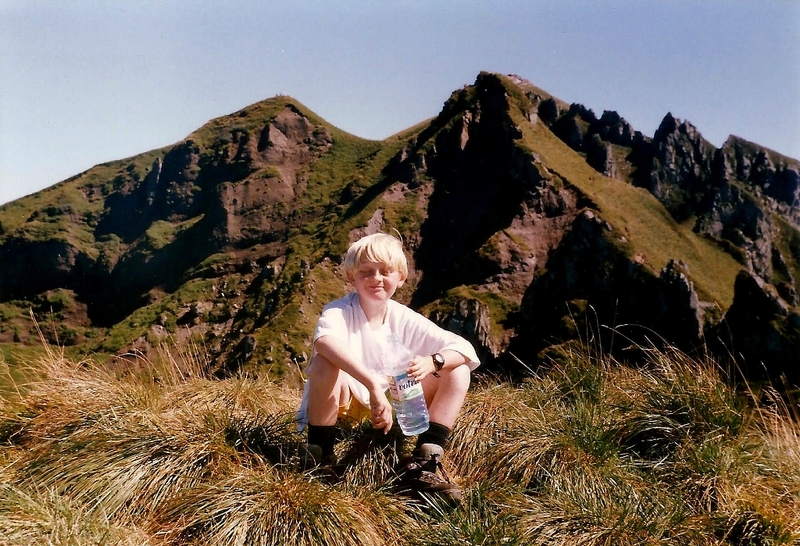 With a glossy new map and a bagful of sandwiches, I set off up open hillside with my son, Fergus, to climb the Puy de Sancy, which with a summit at 1,886 metres (6,188ft) is the highest peak in the Massif Central. According to my research, we’re in an area called the Volcans, it being formed quite recently – in geological terms – by volcanic activity. To the immediate south can be viewed a series of craters, now filled with lakes and clad in lush green grass and forests. 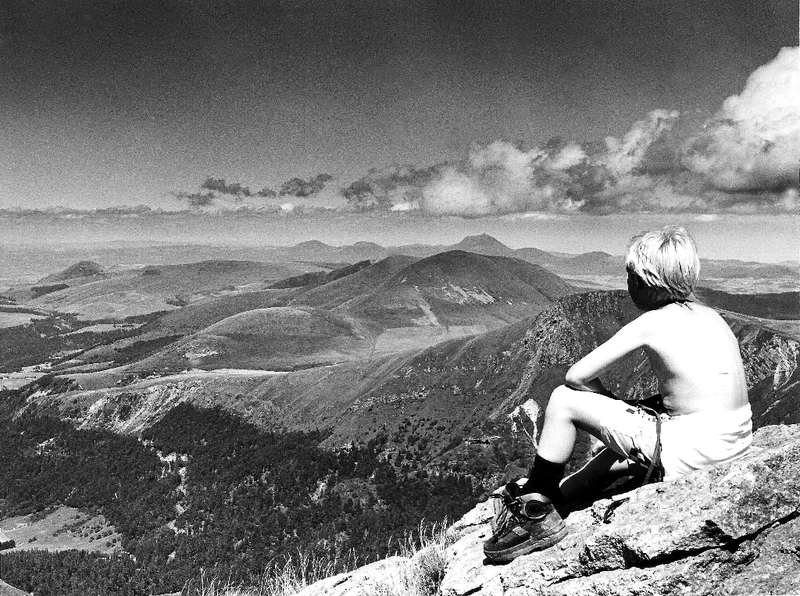 Puy de Sancy itself was last active about 220,000 years ago. We’re not terribly worried about eruptions. On the crest of its western ridge we intercept a path that skirts beneath rocky pinnacles in the direction of the summit. It’s one of those paths that demands to be walked, striking leisurely across steep slopes and with open vistas to the south. Blue sky and distant blue hills. Buzzards and kites soaring on thermals. France at its most alluring. All mountain paths should be as satisfying as this, I muse. 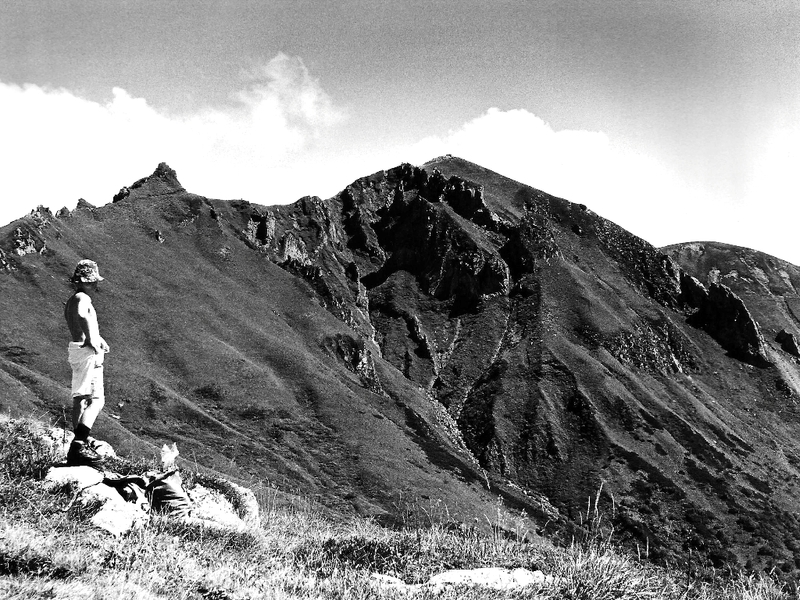 On the slabby summit of Puy de Sancy we sit in the sunshine and eat our sandwiches, while far below the headwaters of the Dordogne – one of the great rivers of Europe – trickle from springs in the volcanic rock to gather and grow. The wind is warm and fierce. Butterflies glide and scatter. Flowers bend their stems and toss their heads wildly. Children. We encourage them to be like ourselves and in doing so they follow us into all sorts of strange and dangerous places in the certain knowledge their parents are infallible. 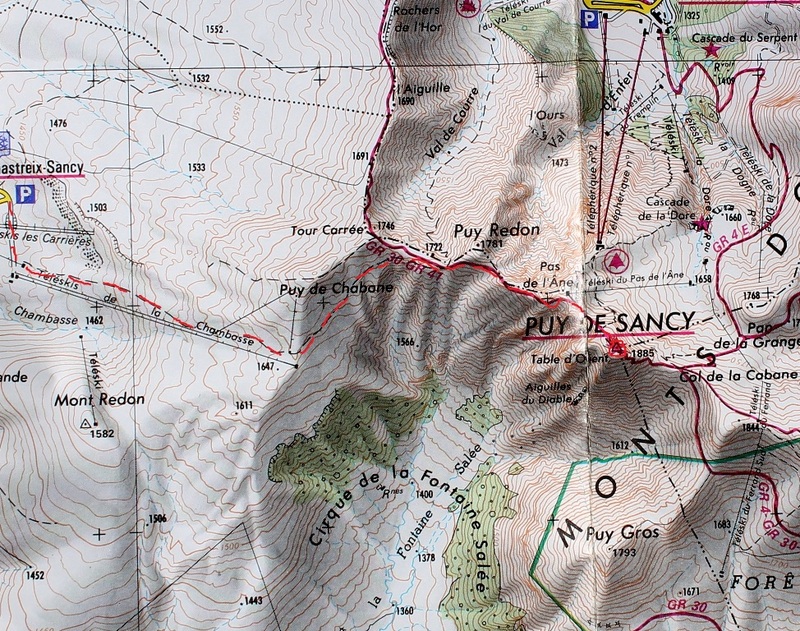 I can’t read the immediate future on Puy de Sancy, but Fergus goes on to accompany me along Great Gable’s South Traverse and thread the Needle (scale the arête between Napes Needle and the crag), help me up the notorious Broad Stand on Scafell (by hauling on my shirt collar from above), and walk the 212-mile Southern Uplands Way and the 90-mile Cumbria Way – all before his fourteenth birthday. Nowadays he’s a roofer, involved in heritage work on churches and listed buildings. So perhaps that early introduction to lofty places played its part. We follow the same route back with the sun in our faces and dust on our boots. That’s our first French mountain climbed. Another tomorrow, perhaps. 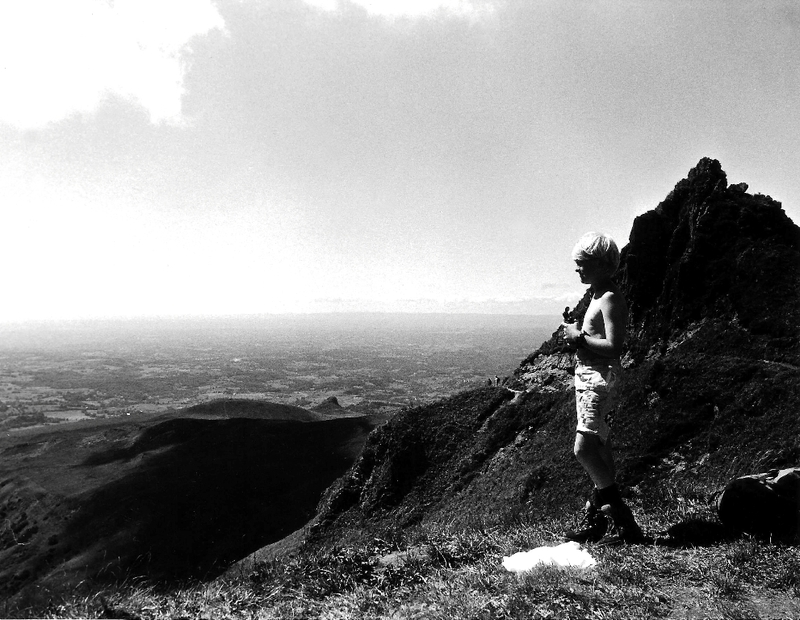 This entry was posted in Butterflies, Camping, Childhood, Climbing, Environment, Footpaths, Geology, Hiking, Mountains, Napes Needle, Rivers, Walking and tagged Cumbria, France, Lake District, outdoors, Scotland. Bookmark the permalink. Very evocative account. 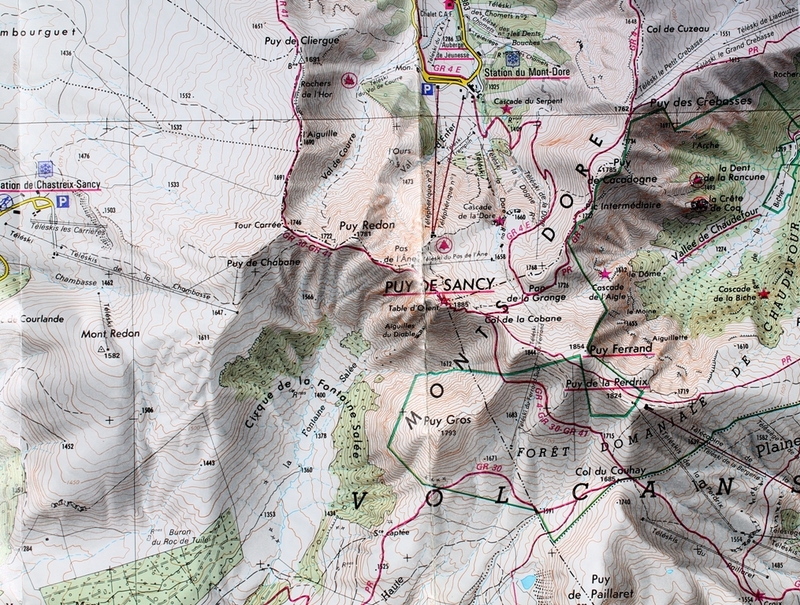 Puy de Sancy sounds wonderful. I’ve always followed Wainwright’s lead regarding Broad Stand – looked up in wonder then retreated with a whispered promise of “next time”. Hi George. I’ve found I’m working in reverse with things like Broad Stand. When I was in my teens and twenties, they didn’t bother me. Nowadays I wouldn’t go within a mile of them. I even have trouble with ladders! Halfway up Sharp Edge on Blencathra my oldest child, about 11 at the time, remarked quite casually “if I get up here alive it will be a miracle”. I began to doubt whether I was infallible but I still managed to guide them down Hallsfell Ridge. Nowadays that son doesn’t go anywhere near mountains whereas the other relishes in them, where does that put me in the guilt stakes? PS That area of France still captivates me. Hi John. I know what you mean. After fourteen, my son discovered street cred and didn’t climb another mountain. But we had a few years of tramping about. Your son’s remark on Sharp Edge reminded me of something Fergus said when we threaded the Needle. A bloke from Preston was climbing behind us, so I went first over the crux and the bloke lifted Fergus onto the top and passed him down to me on the other side. As I grabbed him, he whispered: “That bloke’s got two watches on the same wrist – do you think he’s a nutter?” Things like that stick in your mind. Can’t have been me I don’t often wear a watch! They’re lovely photos and it looks a stunning mountain and a great walk. I’m jealous of you having done Broad Stand and threading the needle on Gable – I’d like to see more about those trips. Hi Carol. Threading the Needle is pretty straightforward, just a bit of scrambling and throwing your leg over the top. Broad Stand is a different matter. You squeeze through a crack and clamber up onto a sloping ledge. That’s the easy bit. The final bit, you have to climb up a vertical slab and pull yourself over the top. It’s not a big slab, about six or seven feet if I remember, but if you lose your grip at this point you’d fall about thirty feet onto Mickledore. I’ve done it a few times, but I wouldn’t do it now because I’ve lost my nerve a bit. I’ve found that the least bit of exposure brings on dizziness. I knew about Broad Stand as I’ve sat and watched people going up it – not for me that one I don’t think as the slabs look pretty smooth and, as you say, are sloping – I’d do it on a rope. Richard turned to descend that way once – he could see the col and thought that was the way to go! Good job he doesn’t walk on his own or he’d have been doing a Coleridge! I’d be very interested in doing the Gable route though – been meaning to have another look at the girdle traverse anyway. Is there much exposure on it? The traverse is my favourite walk in the Lakes. There is no exposure to speak of, just a bit of a swamble over the crux right at the Needle, but the route is obvious and easy peasy. Also, it can be bypassed beneath the Needle. For someone who has done all the Munros on Skye, you should be able to do it blindfold. Thanks for that. I’ve bypassed below it (that’s as far as we got without coming back). BTW – love ‘swamble’ – did you make that up? Don’t know where it comes from. It sort of fits the bill. 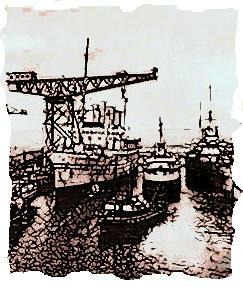 Wonderful evocative memories brought back to life there Alen, many thanks for sharing. Oh, and all power to Fergus!! Wonderful writing and great pictures. Well, our Abi walked all over with us until she was about 13. At that point, she seemed to lose the use of both her legs and her voice……then suddenly, at about 18, this accomplished young lady appeared, able to hold her own in any conversation and mad on snow boarding! 😀 And now she’s expecting our first grandchild, so it’ll all start all over again…. Isn’t it strange how they all veer off the rails at about 13? Mind you, I did as well, so I can’t complain too much. You’ll enjoy taking your grandchild out, Chrissie. I’ve taken my granddaughter on a couple of walks and she loves it. Hi Alen. Thought provoking post. Hi Hanna. That’s a very thoughtful thing for a father to say. Things like that stick in your mind. I used to keep notes of snippets of conversation I overheard on my travels. I don’t know why I did that, I just did. Perhaps I thought they might come in useful. I suppose being a roofer is a sort of mountaineer. I wonder if it’s like the butterfly effect: had you come down the mountain a different route he would have ended up as a window cleaner. That might have happened. He has been in some very high places, and in all sorts of weather.